We’re here when you need us: Culligan has been treating your water needs in Eastern & Central Ontario since 1955. Our business is dedicated to making your water better using the best equipment, best service, and best prices around. We’re Family Owned: Our team lives and works in the local area and we're a family owned and operated business. Warrantied: Culligan residential equipment may come with a Limited Lifetime Warranty. Mark, thanks for the great service you provided us with reference to our water-softener tank, etc. We are pleased with the excellent work you did and the clean-up after. The system is working well and the water is much nicer to the feel. Thanks again. If any more problems come up, you will be the first I call for assistance. Excellent service! Our sales rep was very pleasant and informative. Good job! Mike was so polite and gave us good instructions. Dave Burke showed up promptly and did an excellent presentation describing clearly all our options. He was a real gentleman. He followed up quickly after installation to make sure all went smoothly. Terry did an expert installation. He has serviced us for years. Both these gentlemen are a credit to Culligan. Terry did an expert installation. He has serviced us for years. Both these gentlemen are a credit to Culligan. I highly recommend this company. 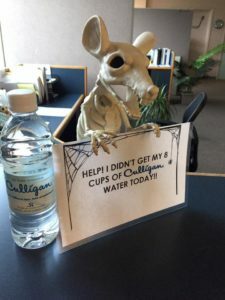 Don’t forget to drink enough Culligan water!